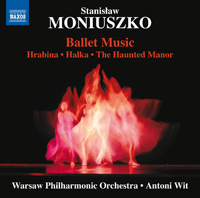 STANISŁAW MONIUSZKO (1819-1872): Concert Polonaise, Funeral March for Anton Orłowski, Civic Polonaise, Leokadia Polka, Mazurka and Highlanders’ Dances from Halka, Ballet Music from The Merry Wives of Windsor, Mazurka from The Haunted Manor, Gypsy Dance from Jawnuta, Mazurka from Monte Christo. Description: A sort of “opera without words” release except that this 78-minute disc consists of Polish-flavored ballet music from operas as early as c. 1849 to 1864 along with two concert polonaises and a short concert polka. Warsaw Philharmonic Orchestra; Antoni Wit.